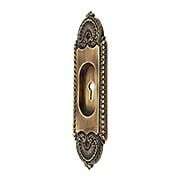 This wonderfully decorative Lorraine Pattern Pocket-Door Pull with Keyhole exudes old-fashioned charm. The circa 1905 Corbin design is faithfully reproduced in stamped bronze to capture every fine and delicate detail of the originals. A chocolaty finish with subtle copper highlights completes the authentic look. 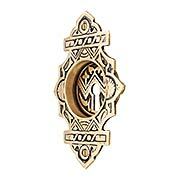 This wonderfully decorative Lorraine Pattern Pocket-Door Pull without Keyhole exudes old-fashioned charm. The circa 1905 Corbin design is faithfully reproduced in stamped bronze to capture every fine and delicate detail of the originals. A chocolaty finish with subtle copper highlights completes the authentic look. The dynamic profile and bold, graphic pattern make this "Oriental" pull an eye-catching accent to your pocket doors. Initially created by Branford Lock Works, circa 1885, the striking design displays an open fan, a rising sun, and bamboo. Cast from solid bronze with a highlighted antique finish. The bold and graphic Oriental pattern is one of our favorites. Initially created by Branford Lock Works, circa 1885, the striking design displays an open fan, a rising sun, and bamboo. Cast from solid bronze with a highlighted antique finish. Russell & Erwin featured this lovely Greek Revival style pull in their 1887 hardware catalog. 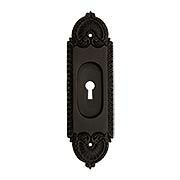 Reproduced directly from an antique original, it's a stylish addition to pocket or bi-pass doors. 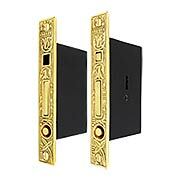 Finely crafted from solid brass, with your choice of lacquered bright brass or antique finishes. Also available in a no-keyhole version. 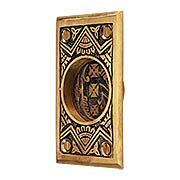 This Windsor Pattern Pocket-Door Pull without Keyhole is one of our finest Victorian-era reproductions. Introduced by Reading Hardware around 1885, the whimsical Aesthetic design is just as fresh and lovely today. Cast in solid brass with a choice of polished or antiqued finish. Russell & Erwin featured this lovely Greek Revival style pull in their 1887 hardware catalog. 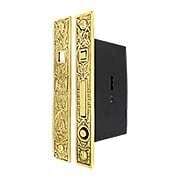 Reproduced directly from an antique original, it's a stylish addition to pocket or bi-pass doors. Finely crafted from solid brass, hand-finished with our living (non-lacquered) antique patina. Also available in a no-keyhole version. 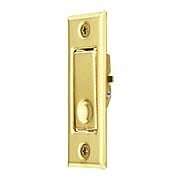 Russell & Erwin featured this lovely Greek Revival style pull in their 1887 hardware catalog. 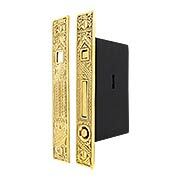 Reproduced directly from an antique original, it's a stylish addition to pocket or bi-pass doors. Finely crafted from solid brass, hand-finished with our living (non-lacquered) antique patina. Also available in a keyhole version. 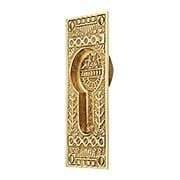 This Windsor Pattern Pocket-Door Pull without Keyhole is one of our finest Victorian-era reproductions. Introduced by Reading Hardware around 1885, the whimsical Aesthetic design is just as fresh and lovely today. Cast in solid brass and finished with our exclusive living patina. 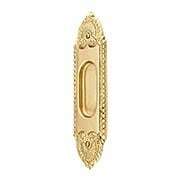 Russell & Erwin featured this lovely Greek Revival style pull in their 1887 hardware catalog. 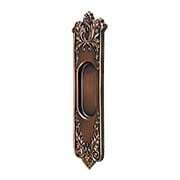 Reproduced directly from an antique original, it's a stylish addition to pocket or bi-pass doors. 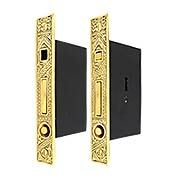 Finely crafted from solid brass, with your choice of lacquered bright brass or antique finishes. 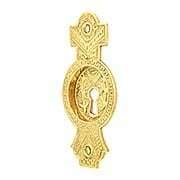 Also available in a keyhole version. 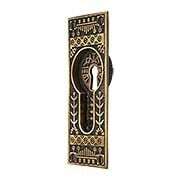 This Windsor Pattern Pocket-Door Pull with Keyhole is one of our finest Victorian-era reproductions. Introduced by Reading Hardware around 1885, the whimsical Aesthetic design is just as fresh and lovely today. 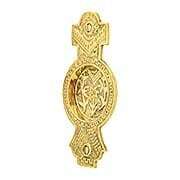 Cast in solid brass with a choice of polished or antiqued finish. 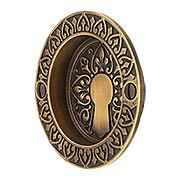 This Windsor Pattern Pocket-Door Pull with Keyhole is one of our finest Victorian-era reproductions. Introduced by Reading Hardware around 1885, the whimsical Aesthetic design is just as fresh and lovely today. Cast in solid brass and finished with our exclusive living patina. Purists will delight in this faithful reproduction of P & F Corbin’s lively and charming “Roanoke” pattern pocket door pull. The circa 1900 design works well with everything from Queen Anne to Craftsman, from restorations to new construction. 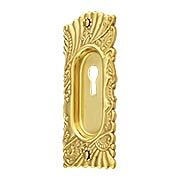 This pull is cast in solid brass and left unlacquered, allowing it to age gracefully and develop highlights with use, just like the antique originals. Purists will delight in this faithful reproduction of P & F Corbin’s lively and charming “Roanoke” pattern pocket door pull. The circa 1900 design works well with everything from Queen Anne to Craftsman, from restorations to new construction. Cast in solid brass, this pull is left unlacquered, allowing it to age gracefully, just like the antique originals. Purists will delight in this faithful reproduction of P & F Corbin’s lively and charming “Roanoke” pattern pocket door pull. The circa 1900 design works well with everything from Queen Anne to Craftsman, from restorations to new construction. 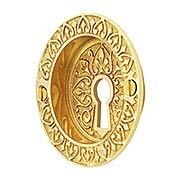 Cast in solid brass, this pull comes in our own Antique-By-Hand finish. This hand-applied process produces a living finish that continues to age gracefully for many years to come. 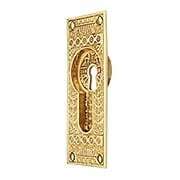 The centerpiece of this Single Lock Pocket-Door Mortise Set features bold geometric markings surrounded by delightful floral patterns. 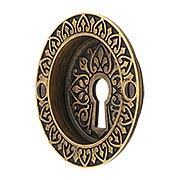 This circa 1880's Eastlake design is reproduced in solid, cast brass with all brass interior working parts. The faceplate and strike are left unlaquered and will develop highlights with use, just like period originals. Pair with our matching pocket-door pulls. 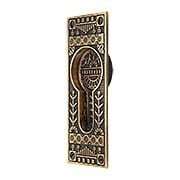 The centerpiece of this Double Lock Pocket-Door Mortise Set features bold geometric markings surrounded by delightful floral patterns. 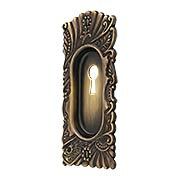 This circa 1880's Eastlake design is reproduced in solid, cast brass with all brass interior working parts. The faceplate and strike are left unlaquered and will develop highlights with use, just like period originals. 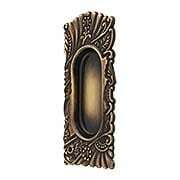 Pair with our matching pocket-door pulls. A dynamic profile and bold, graphic pattern make this Oriental Pocket-Door Pull an eye-catching accent to your pocket doors. This circa 1880's Eastlake design is reproduced in solid, cast brass and displays geometric markings and delightful floral patterns. Left unlaquered, it will gradually develop highlights with use, just like period originals. 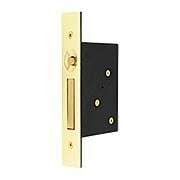 Pair with our matching pocket-door mortise locks. A dynamic profile and flowing patterns make this Bit-Key Single Pocket-Door Mortise Lock an eye-catching accent to your pocket doors. This circa 1880's Eastlake design is reproduced in solid, cast brass and displays a delightful pattern of hummingbirds and butterflies. Left unlaquered, it will gradually develop highlights with use, just like period originals. Pair with our matching pocket-door pulls. A dynamic profile and flowing patterns make this Bit-Key Double Pocket-Door Mortise Lock an eye-catching accent to your pocket doors. This circa 1880's Eastlake design is reproduced in solid, cast brass and displays a delightful pattern of hummingbirds and butterflies. Left unlaquered, it will gradually develop highlights with use, just like period originals. 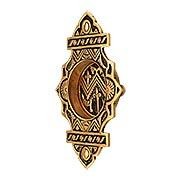 Pair with our matching pocket-door pulls. 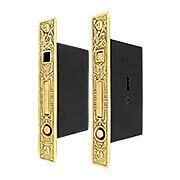 A dynamic profile and flowing patterns make the Broken Leaf Bit-Key Double Pocket-Door Mortise Lock an eye-catching accent to your pocket doors. This circa 1880's Eastlake design is reproduced in solid, cast brass and displays a delightful pattern of flowers and vines. Left unlaquered, it will gradually develop highlights with use, just like period originals. 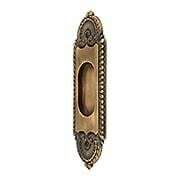 Pair with our matching pocket-door pulls.